My research over the years has shifted from, initially, glaciological field studies performed at the Tarfala Research Station (generously funded by the Swedish Institute) and glaciological modelling studies (under the supervision of Prof. Hans Oerlemans, IMAU Utrecht University), as part of my undergraduate studies in Physical Geography at Utrecht University, to geomorphological studies of glaciers and ice sheets in my subsequent career. During the summer of 1984, Roderik van de Wal (IMAU) and I augmented our undergraduate studies in Physical Geography at Utrecht University with a course in Glaciers and High Mountain Environments at the Tarfala Research Station in northern Sweden. This course would ultimately guide the direction of our future careers as we engaged in field glaciology on Rabots Glaciär for our thesis work and on Storglaciären with Roger Hooke (U. of Maine), and engaged in glacier modeling of the Rhonegletscher with Hans Oerlemans. Five publications of which I am co-author relate to the undergraduate research in northern Sweden and the flow-line modeling. Oerlemans, J., B. Anderson, A. Hubbard, P. Huybrechts, T. Jóhanneson, W.H. Knap, M. Schmeits, A.P. Stroeven, R.S.W. van de Wal, J. Wallinga & Z. Zuo 1998. Modelling the response of glaciers to climate warming. Climate Dynamics, 14 (4): 267-274. Stroeven, A.P. 1996. The robustness of one-dimensional time dependent ice-flow models: A case study from Storglaciären, northern Sweden. Geografiska Annaler, 78A (2-3): 133-146. Stroeven, A.P. & R.S.W. van de Wal 1990: A comparison of the mass balances and the flows of Rabots Glaciär and Storglaciären, Kebnekaise, northern Sweden. Geografiska Annaler, 72A (1): 113-118. Hooke, R.LeB., P. Calla, P. Holmlund, M. Nilsson & A.P. Stroeven 1989: A three year record of seasonal variations in surface velocity, Storglaciären, Sweden. Journal of Glaciology, 35 (120): 235-247. Stroeven, A.P., R.S.W. van de Wal & J. Oerlemans 1989: Historic front variations of the Rhone Glacier: Simulation with an ice flow model. In Oerlemans, J. (ed. ): Glacier Fluctuations and Climatic Change, Kluwer Academic Publishers: 391-405. MsC and PhD thesis studies concerned the question of mid-Pliocene glaciation in Antarctica using deposits of the Sirius Group (tillite). Those favouring ice sheet stability during global mid-Pliocene warmth, base their arguments on geomorphological analysis of ice-free Antarctic terrain and the stratigraphical position of outcrops of the Sirius Group tillites. Those pertaining that these deposits are consistent with a mid-Pliocene deglaciation of the East Antarctic Ice Sheet, base their arguments on the association of mid-Pliocene diatoms as well as vegetation and faunal remains in such deposits. This clash of viewpoints has sometimes resulted in heated debates. I was able to show that the occurrence of marine diatoms in the Sirius Group at Mount Fleming, at the head of Wright Valley (see photograph below), was incompatible with glacial deposition and could therefore not help constrain the age of the deposit (see publications 1992-1999). The research has been supported by a number of foundations, foremost by the Swedish Society for Anthropology and Geography Andrée Fund, and various funds at Stockholm University. Upper Panel: Photograph from a helicopter. In the lower right corner the tongue of UpperWright Glacier is just barely visible as the margin of the East Antarctic Ice Sheet in Wright Valley, Dry Valleys, Antarctica. The upper Sirius Group deposit on Mt Fleming is shown in yellow. Lower Panel: The Sirius Group is a tillite (grey matrix visible in the wall of the pit) which has been heavily deflated as witnessed by the desert pavement at the surface including boulders with varnish and ventifaction. The deposit is draped on a sandstone bedrock bench but the dominant surface lithology of the tillite deflation surface is Ferrar Dolerite. See Stroeven et al. (1996), Stroeven (1997), Stroeven & Prentice (1997) and Stroeven & Kleman (1999). Together with my father Piet Stroeven, I applied stereology, "a set of methods to ensure rigorous quantitative analysis of the size, shape, and number of objects", here applied to small grains in tillite sections- i.e. to derive its microfabric. We used this technique to derive the strength of ice flow using microfabric for the Mt Feather Sirius Group tillite. Thirteen publications of which I am co-author relate to my PhD work in Antarctica and subsequent microfabric studies using stereology. Stroeven, A.P., J.J.M. van der Meer, P. Stroeven, D.H. Dalhuisen, J.F. Hiemstra & M. Stroeven 2002: Improved microfabric determination using stereological analysis: Orientation direction of sand particles in Mount Feather Sirius Group tillite, Antarctica. In: J.A. Gamble, D.N.B. Skinner & S. Henrys (Eds. ): Antarctica at the Close of a Millennium, Royal Society of New Zealand Bulletin, 35: 327-334. Wilson, G.S., J.A. Barron, A.C. Ashworth, R.A. Askin, J.A. Carter, M.G. Curren, D.H. Dalhuisen, E.I. Friedman, D.G. Fyodorov-Davidov, D.A. Gilichinsky, M.A. Harper, D.M. Harwood, J.F. Hiemstra, T.H. Janececk, K.J. Licht, V.E. Ostroumov, R.D. Powell, E.M. Rivkina, S.A. Rose, A.P. Stroeven, P. Stroeven, J.J.M. van der Meer & M.C. Wizevich 2002: The Mount Feather diamicton of the Sirius Group: An accumulation of indicators of Neogene Antarctic glacial and climatic history. Palaeogeography, Palaeoclimatology, Palaeoecology, 182 (1-2): 117-131. Stroeven, P., A.P. Stroeven, D.H. Dalhuisen 2001: Image analysis of 'natural' concrete samples by automatic and manual procedures. Cement & Concrete Composites, 23 (2-3): 227-236 (Elsevier Science). Stroeven, A.P. & J. Kleman 1999: Age of Sirius Group on Mount Feather, McMurdo Dry Valleys, Antarctica, based on glaciological inferences from the overridden mountain range of Scandinavia. Global and Planetary Change, 23 (1-4): 231-247. Stroeven, P., A.P. Stroeven, D.H. Dalhuisen & J.J.M. van der Meer 1999: Stereological analysis of ice flow-induced preferred orientation of small clasts in Tertiary tillite matrix of Mt. Feather. Acta Stereologica, 18 (1): 49-60. Prentice, M.L., J. Kleman & A.P. Stroeven 1998. The composite glacial erosional landscape of the northern McMurdo Dry Valleys: Implications for Antarctic Tertiary glacial history. In J.C. Priscu (ed. ): Ecosystem Dynamics in a Polar Desert: The McMurdo Dry Valleys, Antarctica. Antarctic Research Series, 72: 1-38. Stroeven, A.P. 1997. The Sirius Group of Antarctica: Age and Environments. In: Ricci C.A. (ed. ), The Antarctic Region: Geological Evolution and Processes, Terra Antartica Publication, Siena: 747-761. Stroeven, A.P. & M.L. Prentice, 1997. 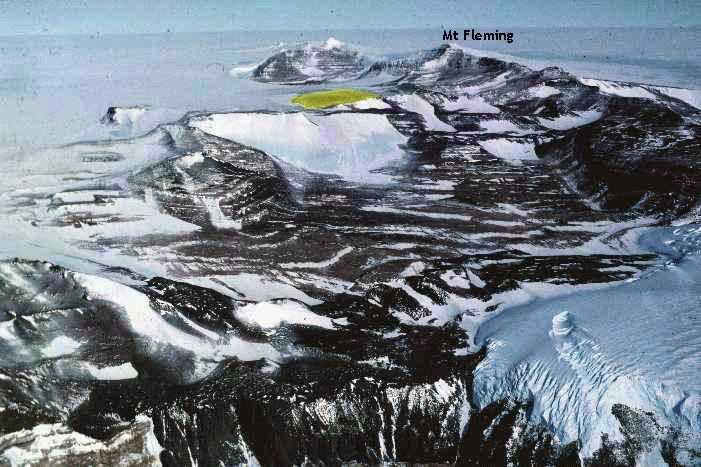 A case for Sirius Group alpine glaciation at Mount Fleming, South Victoria Land, Antarctica: A case against Pliocene East Antarctic Ice Sheet reduction. Geological Society of America Bulletin, 109 (7): 825-840. Burckle, L.H., A.P. Stroeven, C. Bronge, U. Miller & A. Wasell 1996. Deficiencies in the diatom evidence for a Pliocene reduction of the East Antarctic Ice Sheet. Paleoceanography, 11 (4): 379-390. Stroeven, A.P., M.L. Prentice & J. Kleman, 1996. On marine microfossil transport and path­ways in Antarctica during the late Neogene: Evidence from the Sirius Group at Mount Fleming. Geology, 24 (8): 727-730. Stroeven, A.P., H.W. Borns Jr., M.L. Prentice, J.L. Fastook & R.J. Oglesby 1994: Upper Fleming Sirius till: Evidence for local glaciation and warmer climates during the Neogene. In: F.M. van der Wateren, A.L.L.M. Verbers & F. Tessensohn (Eds. ): Landscape Evolution in the Ross Sea Area, Antarctica, Netherlands Geological Survey, Haarlem, The Netherlands: 117-121. After my PhD defence in October 1996, I secured a post-doctoral grant from the Wenner-Gren Foundations which allowed for a stay at the Centre for Glaciology, Aberystwyth University, with Prof. Julien Dowdeswell (1997). During this time I started to develop my long-term research avenue, together with Prof. Jonathan Harbor, on the paleoglaciology of ice sheets in the northern Hemisphere using cosmogenic nuclide studies and numerical modelling. Such studies have since been conducted in collaboration with additional scientists from Australia, Canada, China, Norway, U.S.A. and U.K., and leans strongly on the talent of several PhD students (Goodfellow, Napieralski) and Post-docs (Li, Hubbard, Jansen). Understanding the complexity of glacial landscapes in terms of patterns of preservation and erosion has importance for understanding sediment dispersal patterns as well as the representation of ice sheets in global climate models (height and volume of ice sheets are largely determined by their subglacial conditions). Our work has convincingly shown the longevity of landscape segments in the mountains and in the Swedish lowlands, surfaces that have been largely unmodified for at least the last 0.5 million years. This has been postulated from geomorphological evidence (Kleman & Stroeven, 1997; Hättestrand & Stroeven, 2002) and has been numerically tested using the production of several cosmogenic radionuclides in quartz crystals in bedrock outcrops as a measure of length of exposure, rate of erosion, and length of “glacial” burial. Because the systematic preservation of landscape elements underneath successive ice sheets is directly related to the long-term subglacial temperature field at these locations, this evidence constitutes an important boundary condition for numerical ice sheet models that study the 3-D evolution of the Fennoscandian Ice Sheet. Realistic reconstructions of the latter are of importance in the tuning of General Circulation “climate” models (GCMs) used to predict the direction and magnitude of future climate changes. Bradley Goodfellow (PhD, 2008) was my first PhD student and he very successfully studied the long-term landscape evolution of "relict" surfaces in the northern Swedish mountains. His last publication, in Earth Surface Dynamics, summarizes his extensive findings supporting that blockfield-mantled surfaces, while demonstrably "relict" in relation to the last ice sheet coverage, are landscape elements that have formed during the Quaternary. long periods of burial and insignificant subglacial erosion by the Fennoscandian Ice Sheet. These field studies in northern Fennoscandia (Norway, Sweden, Finland) were conducted between 1998 and 2003 with generous support from The Swedish Research Council to Stroeven (1998, 1999-2001, 2002-2004) and from NSF to Harbor (1999-2001, 2002-2004). 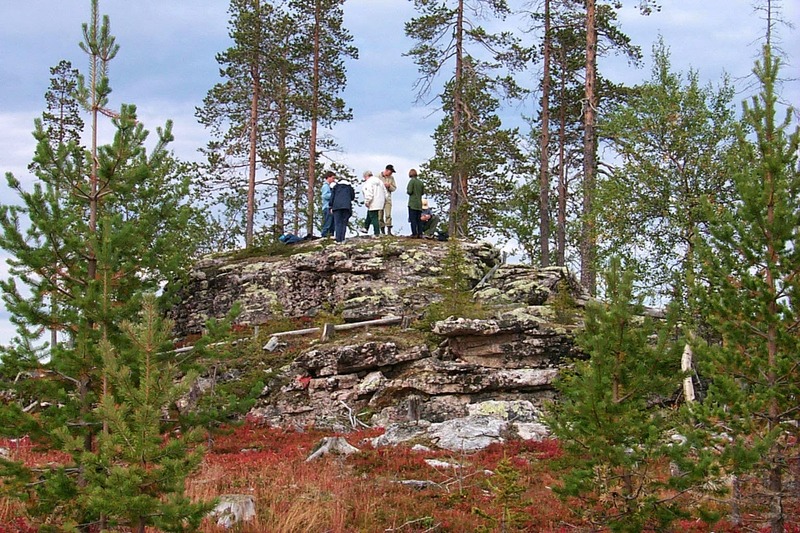 Related to this research, a programme led by Clas Hättestrand has investigated the paleoglaciology of the Kola Peninsula (e.g., Hättestrand et al., 2007). Our research campaigns complement each other and have led to a new deglaciation map for northern Fennoscandia (2016, Quaternary Science Reviews), an excerpt of which was also published this year in Nature Communications. In summer 2016, Nat Lifton, Gunhild Rosqvist, and myself investigated the Holocene history of a northern Swedish valley glacier (Isfallsglaciären) and ice cap (Riukojietna). We will couple the cosmogenic nuclide results to lake sediments studies - the formerly traditional appraoch to the study of Holocene glacier variations. Thirty publications of which I am co-author relate to our paleoglaciological, modeling, and cosmogenic nuclide research in northern Fennoscandia. Patton, H., A. Hubbard, K. Andreassen, A. Auriac, P.L. Whitehouse, A.P. Stroeven, C. Shackleton, M. Winsborrow, J. Heyman & A.M. Hall 2017: Deglaciation of the Eurasian ice sheet complex. Quaternary Science Reviews, 169: 148-172. Patton, H., A. Hubbard, K. Andreassen, M. Winsborrow & A.P. Stroeven 2016: The build-up, configuration, and dynamical sensitivity of the Eurasian ice-sheet complex to Late Weichselian climatic and oceanic forcing. Quaternary Science Reviews, 153: 97-121. Stroeven, A.P., C. Hättestrand, J. Kleman, J. Heyman, D. Fabel, O. Fredin, B.W. Goodfellow, J.M. Harbor, J.D. Jansen, L. Olsen, M.W. Caffee, D. Fink, J. Lundqvist, G.C. Rosqvist, B. Strömberg, & K.N. Jansson 2016: Deglaciation of Fennoscandia. Quaternary Science Reviews, 147: 91-121. Stroeven, A.P., J. Heyman, D. Fabel, S. Björck, M.W. Caffee, O. Fredin, & J.M. Harbor 2015. A new Scandinavian reference 10Be production rate. Quaternary Geochronology, 29: 104-115. Goodfellow, B.W., A.P. Stroeven, D. Fabel, O. Fredin, M.-H. Derron, R. Bintanja & M.W. Caffee 2014. Arctic-alpine blockfields in the northern Swedish Scandes: late Quaternary – not Neogene. Earth Surface Dynamics, 2: 383-401. Jansen, J., A.T. Codilean, A.P. Stroeven, D. Fabel, C. Hättestrand, J. Kleman, J.M. Harbor, J. Heyman, P.W. Kubik & S. Xu 2014. Inner gorges cut by subglacial meltwater during Fennoscandian ice sheet decay. Nature Communications, 5:3815 doi: 10.1038/ncomms4815. Stroeven, A.P., J. Harbor & J. Heyman. 2013. Erosional landscapes. In: John F. Shroder (ed.) Treatise on Geomorphology, Vol. 8, Glacial and Periglacial Geomorphology, pp. 100-112. San Diego: Academic Press. Jansson, K.N., A.P. Stroeven, G. Alm, K.I.T. Dahlgren, N.F. Glasser & B.W. Goodfellow 2011: Using a GIS filtering approach to replicate patterns of glacial erosion. Earth Surface Processes and Landforms, 36: 408-418. Stroeven, A.P., D. Fabel, J. Harbor, D. Fink, M.W. Caffee & T. Dahlgren 2011. Importance of sampling across an assemblage of glacial landforms for interpreting cosmogenic ages of deglaciation. Quaternary Research, 76: 148-156. Goodfellow, B.W., O. Fredin, M.-H. Derron & A.P. Stroeven, 2009: Weathering processes and Quaternary origin of an alpine blockfield in Arctic Sweden. Boreas, 38: 379-398. Goodfellow, B.W., A.P. Stroeven, C. Hättestrand, J. Kleman & K.N. Jansson 2008. Deciphering a non-glacial/glacial landscape mosaic in the northern Swedish mountains. Geomorphology, 93: 213-232. Kleman, J., A.P. Stroeven & J. Lundqvist 2008. Patterns of Quaternary ice sheet erosion and deposition in Fennoscandia and a theoretical framework for explanation. Geomorphology, 97 (1-2): 73-90. Li, Y.K., D. Fabel, A.P. Stroeven & J. Harbor 2008. Unraveling complex exposure-burial histories of bedrock surfaces under ice sheets by integrating cosmogenic nuclide concentrations with climate proxy records. Geomorphology, 99 (1-4): 139-149. Hättestrand, C., V. Kolka & A.P. Stroeven 2007. The Keiva ice marginal zone on the Kola Peninsula, northwest Russia: a key component for reconstructing the palaeoglaciology of the northeastern Fennoscandian Ice Sheet. Boreas, 36: 352-370. Napieralski, J., A. Hubbard, YK.. Li, J. Harbor, A.P. Stroeven, J. Kleman, G. Alm & K.N. Jansson 2007: Towards a GIS assessment of numerical ice sheet model performance using geomorphological data. Journal of Glaciology, 53 (180): 71-83. Fabel, D., D. Fink, O. Fredin, J. Harbor, M. Land & A.P. Stroeven 2006: Exposure ages from relict lateral moraines overridden by the Fennoscandian ice sheet. Quaternary Research, 65 (1): 136-146. Harbor, J., A.P. Stroeven, D. Fabel, A. Clarhäll, J. Kleman, Y.K. Li, D. Elmore & D. Fink 2006: Cosmogenic nuclide evidence for minimal erosion across two subglacial sliding boundaries of the late glacial Fennoscandian ice sheet. Geomorphology, 75: 90-99. Stroeven, A.P., J. Harbor, D. Fabel, J. Kleman, C. Hättestrand, D. Elmore & D. Fink 2006: Characteristic -cosmogenic nuclide concentrations in relict surfaces of formerly glaciated regions. Chapter 90 in Glacier Science and Environmental Change, Blackwell Publishing Ltd (ed. P.G. Knight): 447-449. Stroeven, A.P., J. Harbor, D. Fabel, J. Kleman, C. Hättestrand, D. Elmore, D. Fink & O. Fredin 2006: Slow, patchy landscape evolution in northern Sweden despite repeated ice-sheet glaciation. GSA Special Paper, 398 (eds. Willett, S.D., Hovius, N., Brandon, M.T., and Fisher, D.M. ): Tectonics, Climate and Landscape Evolution: 387-396. Li, Y.K., J. Harbor, A.P. Stroeven, D. Fabel, J. Kleman, D. Fink, M. Caffee & D. Elmore 2005: Ice sheet erosion patterns in valley systems in northern Sweden investigated using cosmogenic nuclides. Earth Surface Processes and Landforms, 30: 1039-1049. Hättestrand, C., S. Kosche, J.-O. Näslund, D. Fabel & A.P. Stroeven 2004. 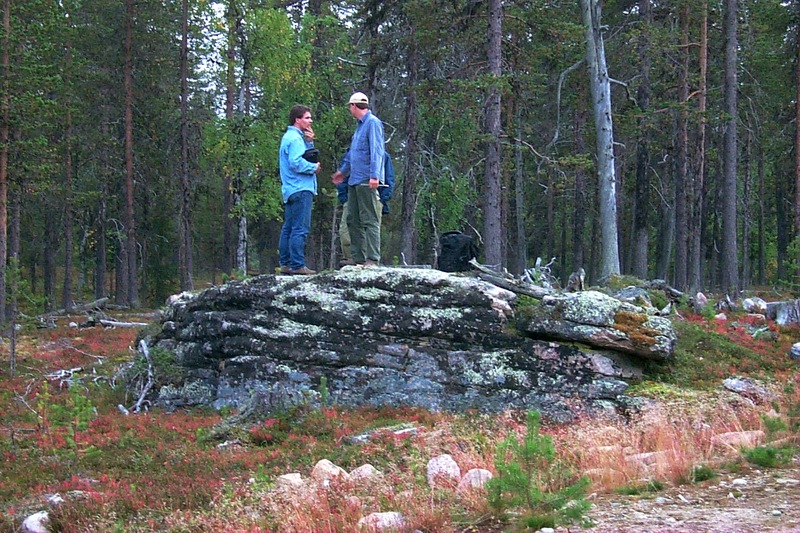 Drumlin formation time: Evidence from northern and central Sweden. Geografiska Annaler, 86A (2): 155-167. Stroeven, A.P. 2004: Glacier. In: Goudie A.S. (ed. ): Encyclopedia of Geomorphology, vol. 1. Routledge: 454-459. Fabel, D., A.P. Stroeven, J. Harbor, J. Kleman, D. Elmore & D. Fink 2002: Landscape preservation under Fennoscandian ice sheets determined from in situ produced 10Be and 26Al. Earth and Planetary Science Letters, 201 (2): 397-406. Hättestrand, C. & A.P. Stroeven 2002: A relict landscape in the centre of Fennoscandian glaciation: Geomorphological evidence of minimal Quaternary glacial erosion. Geomorphology, 44 (1-2): 127-143. Stroeven, A.P., D. Fabel, J. Harbor, C. Hättestrand & J. Kleman 2002: Quantifying the erosional impact of the Fennoscandian ice sheet in the Torneträsk-Narvik corridor, northern Sweden. Geografiska Annaler, 84A (3-4): 275-287. Stroeven, A.P., D. Fabel, J. Harbor, C. Hättestrand & J. Kleman 2002: Reconstructing the erosion history of glaciated passive margins: Applications of in-situ produced cosmogenic nuclide techniques. In Doré, A.G., J. Cartwright, M.S. Stoker, J. P. Turner & N. White (eds): Exhumation of the North Atlantic Margin: Timing, Mechanisms and Implications for Petroleum Exploration. Geological Society, London, Special Publications, 196: 153-168. Stroeven, A.P., D. Fabel, C. Hättestrand & J. Harbor 2002: A relict landscape in the centre of Fennoscandian glaciation: Cosmogenic radionuclide evidence of tors preserved through multiple glacial cycles. Geomorphology, 44 (1-2): 145-154. Kleman, J. & A.P. Stroeven 1997. Preglacial surface remnants and Quaternary glacial regimes in northwestern Sweden. Geomorphology, 19 (1-2): 35-54. Kleman, J., C. Hättestrand, I. Borgström & A.P. Stroeven 1997. Fennoscandian paleoglaciology reconstructed using a glacial geological inversion model. Journal of Glaciology, 43: 283-299. The Cordilleran Ice Sheet is one of the least understood ephemeral northern Hemisphere ice sheets. The ice sheet grew and contracted over steep topograpy; the coastal ranges of British Columbia (BC) and the Yukon Territory (YT) and the inland Rocky Mountains. Because of the influence of the steep topography on ice sheet behaviour, field evidence often only has local to regional significance. In the field component, we investigated the chronology of the northern margin of the Cordilleran Ice Sheet, that is the timing of maximum ice sheet extent and maximum ice sheet thickness, during the last glaciation and previous glaciations. In the modelling component, we studied the behaviour of the Cordilleran Ice Sheet during the last glacial cycle. The study was performed in collaboration with Dr. Derek Fabel, Prof. John Clague, and Dr. Irina Rogozhina.Two PhD students have been involved in the research. As part of his PhD under supervision of Dr. Krister Jansson, Dr. Martin Margold (PhD, 2012) investigated the deglaciation of the southern sector of the Cordilleran Ice Sheet using meltwater traces and cosmogenic nuclide dating. He found that meltwater traces yield a regionally and temporally consistent picture of ice sheet retreat, for which hitherto there was only local evidence. Julien Seguinot investigated the evolution of the Cordilleran Ice Sheet over a glacial cycle using using PISM, an open source, parallel, high-resolution ice sheet model. He found that once initiated early-on in the last glacial cycle, some ice centres persist throughout the last glacial cycle, whereas the Cordilleran Ice Sheet only persists during relatively short bursts of time in Marine Oxygen Isotope stages 4 and 2.
highest ice surface level during the last glacial maximum in this region. My field research in Canada was conducted between 2006 and 2008, with generous support from The Swedish Research Council to Stroeven (2006-2008). The modelling component, including the PhD position, was equally generously funded by the Swedish Research Council to Stroeven (2009-2011). Twelve publications relate to research in North America of which I was part. Seguinot, J., I. Rogozhina, A.P. Stroeven, M. Margold & J. Kleman 2016: Numerical simulations of the Cordilleran ice sheet through the last glacial cycle. The Cryosphere, 10: 639-664. Margold, M., A.P. Stroeven, J.J. Clague & J. Heyman 2014. Timing of terminal Pleistocene deglaciation at high elevations in southern and central British Columbia constrained by 10Be exposure dating. Quaternary Science Reviews, 99: 193-202. Seguinot, J., C. Khroulev, I. Rogozhina, A.P. Stroeven & Q. Zhang 2014. The effect of climate forcing on numerical simulations of the Cordilleran ice sheet at the Last Glacial Maximum. The Cryosphere, 8: 1087-1103. Stroeven, A.P., D. Fabel, M. Margold, J.J. Clague & S. Xu 2014. Investigating absolute chronologies of glacial advances in the NW sector of the Cordilleran Ice Sheet with terrestrial in situ cosmogenic nuclides. Quaternary Science Reviews, 92: 429-443. Margold, M., K.N. Jansson, J. Kleman & A.P. Stroeven 2013: Lateglacial ice dynamics of the Cordilleran Ice Sheet in northern British Columbia and southern Yukon Territory: retreat pattern of the Liard Lobe reconstructed from the glacial landform record. Journal of Quaternary Science, 28: 180-188. Margold, M., K.N. Jansson, J. Kleman, A.P. Stroeven & J.J. Clague 2013. Retreat pattern of the Cordilleran Ice Sheet in central British Columbia at the end of the last glaciation reconstructed from glacial meltwater landforms. Boreas, 42 (4): 830-847. Margold, M., K.N. Jansson, J. Kleman & A.P. Stroeven 2011. Glacial meltwater landforms of central British Columbia. Journal of Maps, 7 (1): 486-506. Kleman, J., K. Jansson, H. de Angelis, A.P. Stroeven, C. Hättestrand, G. Alm & N. Glasser 2010: North American Ice Sheet build-up during the last glacial cycle, 115-21 kyr. Quaternary Science Reviews, 29: 2036-2051. Stroeven, A.P., D. Fabel, A.T. Codilean, J. Kleman, J.J. Clague, M. Miguens-Rodriguez & S. Xu, 2010: Investigating the glacial history of the northern sector of the Cordilleran Ice Sheet with cosmogenic 10Be concentrations in quartz. Quaternary Science Reviews, 29 (25-26): 3630-3643. Jansson, K.N., A.P. Stroeven & J. Kleman 2003: Configuration and timing of Ungava Bay ice streams, Labrador-Ungava, Canada. Boreas, 32: 256-262. Kleman, J., J. Fastook & A.P. Stroeven 2002. Geologically and geomorphologically constrained numerical model of Laurentide Ice Sheet inception and build-up. Quaternary International, 95-96: 87-98. Hättestrand, C. & A.P. Stroeven 1996. Field evidence for wet-based ice sheet erosion from the south-central Queen Elizabeth Islands, Northwest Territories, Canada. Arctic and Alpine Research, 28 (4): 466-474. The research developed in Tibet and Central Asia has been stimulated by Dr. Yingkui Li, been made possible by grants from the Swedish International Development Cooperation Agency (SIDA) through their cooperation with the Swedish Research Council in their "links" programme and through the Swedish Research Council to Stroeven, and support by the Dean of Science and the Department for the full funding of two PhD students (2006-2010; 2009-2013). We have performed fieldwork each year (up to four fieldworks/year) since 2004 in the following regions (responsible scientist(s) in brackets). Dr. Yingkui Li, a former postdoctoral researcher with Harbor within the Fennoscandia project (Li et al., 2005, 2008), introduced us to long-term landscape evolution issues in Central Asia starting with a fieldwork in the Kunlun Shan (together with Gengnian Liu, Jon Harbor and Marc Caffee). Here we sampled river sands, fluvial terraces, and moraines to understand the complexity of landscape evolution in this region. Some results from this first field season have recently been published (Li et al., 2014). We also attempted to connect to an ongoing debate whether the Tibetan Plateau had been covered by an ice sheet the size of Greenland during the last glaciation. We found no evidence for this phenomenon, but decided that this question was perhaps better addressed in other regions of the Tibetan Plateau which motivated the writing of proposals to SIDA to start a new project in the Bayan Har Shan. Support by Sida (2005-2007) allowed for the development of a new project on the north-eastern margin of the Tibetan Plateau in a region supposedly covered by a Tibetan Ice Sheet during the last glaciation, but for which Chinese scientists had presented evidence for the existence of a much smaller ice sheet during that time. Jakob Heyman (PhD, 2010) investigated this area for his PhD degree and found that former glaciation was highly restricted to the highest mountains. For this excellent piece of work he was awarded the Alfortska priset for the best thesis in Physical Geography in Sweden during 2010 and was awarded the Young Scientist Outstanding Poster Paper (YSOPP) Award of the European Geosciences Union two years in a row (2008, 2009). The work builds on three field seasons, two of which Jakob Heyman led. Another grant by Sida (2008-2010) was instrumental in the organisation of fieldwork in support of another PhD study on the paleoglaciology of the Tibetan Plateau. The choice of fieldwork area, the Haizishan area, was motivated by the fact that this region is riddled by lakes and bare-bedrock outcrops- much as can be seen in other regions formerly glaciated by ice sheets, but which is rare on the Tibetan Plateau. Thanks to the support of the Dean of Science and the Department, we were able to recruit Ping Fu (PhD, 2013). She found that the paleoglaciology of this region immediately south of Jakob Heyman's was characterised by ice cap glaciations and with the timing of glaciation deviating from the former study. The latter is perhaps due to the influence of monsoon precipitation which does not affect the Bayan Har Shan araea. The work builds on four field seasons, three of which Ping Fu led. For her work, Ping Fu was awarded the Young Scientist Outstanding Poster Paper (YSOPP) Award of the European Geosciences Union 2013. After many years of intensive research on the eastern Tibetan Plateau we realised that differences in timing of glaciation were probably due to large-scale shifts in climate patterns, affecting some regions differently than others. We therefore decided to "extend" the Tibetan dataset towards the high mountain regions of Central Asia, and the first ideas of the Central Asia Paleoglaciology Project (CAPP) were born. It was again Yingkui Li and Gengnian Liu who were instrumental in jump-starting this phase of the project by inviting Jon and myself to participate in a field season investigating the glacial history of the Urumqi River source region in the Tianger Range and the glacial history of the mountain slope on the other (southern) side of the water divide (Li et al., 2014). Due to differences in climate (drier) and hypsometry (more gentle), the southern slope preserves a much longer glacial record than the much-better investigated northern slope. The CAPP logo designed by Casey Beel. Thanks to an internationalisation grant from the Vice Chancellor of Stockholm University, my application, including prioritized partner universities in Russia, China and the USA, received enough support to organise a constituting meeting and kick-off of the CAPP project in Bishkek, Kyrgyzstan, and a visit to the Inylcheck Glacier region, summer 2011. Thanks to a regular grant from the Swedish Research Council to Stroeven (2012-2015), including resources for a PhD student, the project attracted Robin Blomdin (PhD, 2016) and Natacha Gribenski (PhD, 2016) and more than a dozen partner universities and academy of sciences, all focussed on a documentation of and understanding of the spatial variability of glacial responses. Field seasons to the Eastern Tian Shan (2010), central Tian Shan in China (2012), and the Inylcheck area (2011, 2012; Lifton et al., 2014), Ak Shyrak area (2012, 2014), and the Ala Archa mountains close to Bishkek in Kyrgyzstan, have yielded an opportunity to field-check the glacial geomorphological map of the Tian Shan (Stroeven et al., 2013).The study of the Inylcheck area, spearheaded by Nat Lifton, details the chronology of the Inylcheck Glacier and adjacent glaciers in the Sary-Dzaz valley and constitutes the project's first "datapoints" in the western Tian Shan. to the Inylcheck Glacier was sponsored by the Vice Chancellor of Stockholm University. Same group as above during the fieldtrip, here at the Inylcheck settlement, including Nat Lifton (Purdue University), third from the left, another Peace Corps volunteer, and three drivers. The second area of interest to CAPP in central Asia is the Altai Mountains. Straddling the borders between, primarily, China, Russia and Mongolia, studying its glacial history involves fieldworks in all three countries. Over the past four years, each region has been targeted by at least two field campaigns, organised through Chinese (Zhang Wei), Russian (Dmitry Petrakov), and Mongolian (Michael Walther) colleagues, respectively. Blomdin and Gribenski have led the research in these field visits, and they have led analyses of cosmogenic (Blomdin, Gribenski) and optically-stimulated luminescence (OSL; Gribenski) samples and paper writing (Blomdin et al., 2016a, b; Gribenski et al., 2016). Field reconnaissance trip in Mongolia. Upper panel. OK we are lost! Middle panel. Orkhonselenge (National University of Mongolia). Together with my colleagues and students I have currently written 19 articles, of which 5 glacial geomorphological maps, from the work conducted in Tibet-central Asia. We expect that by the end of the current project we will have c 20 articles which, together with the published maps will yield a consistent database of information (glacier extent and timing). In future projects, we will use the footprint of glaciation to query past climate change. Gribenski, N., S. Lukas, A.P. Stroeven, K.N. Jansson, J.M. Harbor, R. Blomdin, M.N. Ivanov, J. Heyman, D.A. Petrakov, A. Rudoy, T. Clifton, N.A. Lifton & M.W. Caffee 2017. Reply to comment received from J. Herget et al. regarding “Complex patterns of glacier advances during the late glacial in the Chagan Uzun Valley, Russian Altai” by Gribenski et al. (2016), Quaternary Science Reviews 149, 288-305. Quaternary Science Reviews, 168: 219-221. Blomdin, R., J. Heyman, A.P. Stroeven, C. Hättestrand, J.M. Harbor, N. Gribenski, K.N. Jansson, D.A. Petrakov, M.N. Ivanov, O. Alexander, A.N. Rudoy & M. Walther 2016a. Glacial geomorphology of the Altai and Western Sayan Mountains, Central Asia. Journal of Maps, 12: 123-136. DOI: 10.1080/17445647.2014.992177. Blomdin, R., A.P. Stroeven, J.M. Harbor, N.A. Lifton, J. Heyman, N. Gribenski, D.A. Petrakov, M.W. Caffee, M.N. Ivanov, C. Hättestrand, I. Rogozhina & R. Usubaliev 2016b. Evaluating the timing of former glacier expansions in the Tian Shan: a key step towards robust spatial correlations. Quaternary Science Reviews, 153: 78-96. Gribenski, N., K.N. Jansson, S. Lukas, A.P. Stroeven, J.M. Harbor, R. Blomdin, M.N. Ivanov, J. Heyman, D.A. Petrakov, A. Rudoy, T. Clifton, N.A. Lifton & M.W. Caffee 2016. Complex patterns of glacier advances during the late glacial in the Chagan Uzun Valley, Russian Altai. Quaternary Science Reviews, 149: 288-305. Li, Y.K., D. Li, G.N. Liu, J. Harbor, M.W. Caffee & A.P. Stroeven 2014a. Patterns of landscape evolution on the central and northern Tibetan Plateau investigated using in-situ produced 10Be concentrations from river sediments. Earth & Planetary Science Letters, 398: 77-89. Li, Y.K., G.N. Liu, Y.X. Chen, Y.N. Li, J. Harbor, A.P. Stroeven, M. Caffee, M. Zhang, C.C. Li & Z.J. Cui 2014b. Timing and extent of Quaternary glaciations in the Tianger Range, eastern Tian Shan, China, investigated using 10Be surface exposure dating. Quaternary Science Reviews, 98: 7-23. Lifton, N., C. Beel, C. Hättestrand, C. Kassab, I. Rogozhina, R. Heermance, M. Oskin, D. Burbank, R. Blomdin, N. Gribenski, M. Caffee, B.M. Goehring, J. Heyman, M. Ivanov, Y. Li, Y.K. Li, D. Petrakov, R. Usubaliev, A.T. Codilean, Y.X Chen, J. Harbor & A.P. Stroeven 2014. Constraints on the late Quaternary glacial history of the Inylchek and Sary-Dzaz valleys from in situ cosmogenic 10Be and 26Al, eastern Kyrgyz Tian Shan. Quaternary Science Reviews, 101: 77-90. Fu, P., J.M. Harbor, A.P. Stroeven, C. Hättestrand, J. Heyman & L.P. Zhou 2013a: Glacial geomorphology and paleoglaciation patterns in Shaluli Shan, the southeastern Tibetan Plateau — Evidence for polythermal ice cap glaciation. Geomorphology, 182: 66-78. Fu, P., A.P. Stroeven, J.M. Harbor, C. Hättestrand, J. Heyman, M.W. Caffee & L.P. Zhou 2013b: Paleoglaciation of Shaluli Shan, Southeastern Tibetan Plateau. Quaternary Science Reviews, 64: 121-135. Stroeven, A.P., C. Hättestrand, J. Heyman, J. Kleman & B.M. Morén 2013: Glacial geomorphology of the Tian Shan. Journal of Maps, 9 (4): 505-512. Fu, P., J. Heyman, C. Hättestrand, A.P. Stroeven & J.M. Harbor 2012: Glacial geomorphology of the Shaluli Shan area, southeastern Tibetan Plateau. Journal of Maps, 8 (1): 48-55. Heyman, J., A.P. Stroeven, M.W. Caffee, C. Hättestrand, J.M. Harbor, Y.K. Li, H. Alexanderson, L.P. Zhou & A. Hubbard 2011a. Palaeoglaciology of Bayan Har Shan, NE Tibetan Plateau: exposure ages reveal a missing LGM expansion. Quaternary Science Reviews, 30: 1988-2001. Heyman, J., A.P. Stroeven, J.M. Harbor & M.W. Caffee 2011b. Too young or too old: Evaluating cosmogenic exposure dating based on an analysis of compiled boulder exposure ages. Earth and Planetary Science Letters, 302: 71-80. Kirchner, N., R. Greve, A.P. Stroeven & J. Heyman 2011. Paleoglaciological reconstructions for the Tibetan Plateau during the last glacial cycle: evaluating numerical ice sheet simulations driven by GCM-ensembles. Quaternary Science Reviews, 30: 248-267. Margold, M. K.N. Jansson, A.P. Stroeven & J.D. Jansen 2011. Glacial Lake Vitim, a 3000-km3 outburst flood from Siberia to the Arctic Ocean. Quaternary Research, 76: 393-396. Morén, B., J. Heyman & A.P. Stroeven 2011. Glacial geomorphology of the central Tibetan Plateau. Journal of Maps, 7 (1): 115-125. Heyman, J., A.P. Stroeven, H. Alexanderson, C. Hättestrand, J. Harbor, Y.K. Li, M.W. Caffee, L.P. Zhou, D. Veres, F. Liu & M. Machiedo, 2009. Palaeoglaciation of Bayan Har Shan, northeastern Tibetan Plateau: Glacial geology indicates maximum extents limited to ice cap and ice field scales. Journal of Quaternary Science, 24 (7): 710-727. Stroeven, A.P., C. Hättestrand, J. Heyman, J. Harbor, Y.K. Li, L.P. Zhou, M.W. Caffee, H. Alexanderson, J. Kleman, H.Z. Ma & G.N. Liu 2009. Landscape analysis of the Huang He headwaters, NE Tibetan Plateau – patterns of glacial and fluvial erosion. Geomorphology, 103 (2): 212-226. Heyman, J., C. Hättestrand & A.P. Stroeven 2008. Glacial geomorphology of the Bayan Har sector of the NE Tibetan Plateau. Journal of Maps, 4 (1): 42-62. The first proposal for our research on the East Antarctic Ice Sheet margin in Dronning Maud Land (DML), using cosmogenic nuclide dating, was written in 2004 for the International Polar Year (2007-2008) together with Torbjörn Dahlgren, and was submitted for consideration in the Norwegian program. The effort was renewed when Neil Glasser contacted me, and the proposal was submitted for logistical support to the Swedish Research Council in 2010 and adopted by the Swedish Polar Research Secretariat for implementation. The acronym MAGIC-DML was first suggested in 2014 and our logo (below) was created by Dominic Atibil adopted on Antarctica Day in 2016. In 2015 we recruited Jennifer Newall as new PhD student to the project. 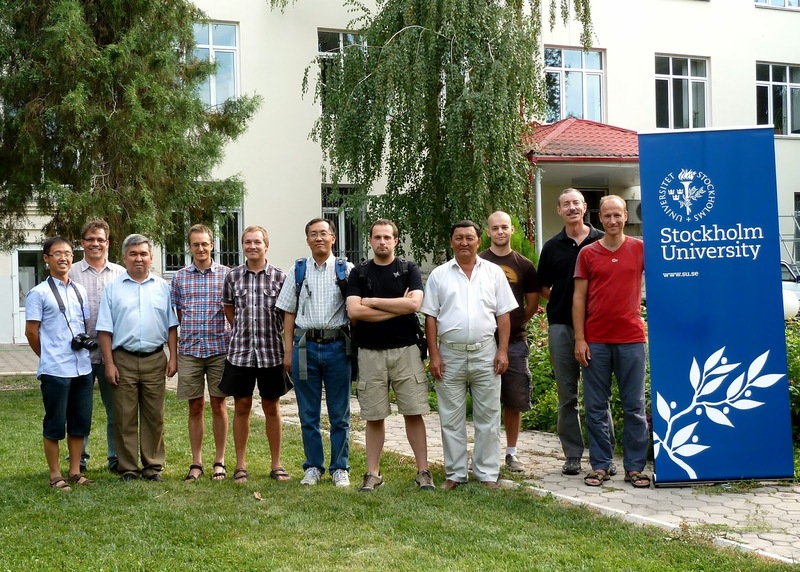 The international team further comprises Derek Fabel (SUERC), Jon Harbor (Purdue University), Irina Rogozhina (MARUM), Ola Fredin (NGU), Nat Lifton (Purdue University), Jorge Bernales (GFZ), and Olaf Eisen (AWI). A Summary of my bibliography at Google scholar (where also links to most papers can be found): http://scholar.google.com/citations?hl=en&user=nJlmI60AAAAJ&view_op=list_works&pagesize=100. Blomdin, R., J. Heyman, A.P. Stroeven, C. Hättestrand, J.M. Harbor, N. Gribenski, K.N. Jansson, D.A. Petrakov, M.N. Ivanov, O. Alexander, A.N. Rudoy & M. Walther 2016. Glacial geomorphology of the Altai and Western Sayan Mountains, Central Asia. Journal of Maps, 12: 123-136. DOI: 10.1080/17445647.2014.992177. Blomdin, R., A.P. Stroeven, J.M. Harbor, N.A. Lifton, J. Heyman, N. Gribenski, D.A. Petrakov, M.W. Caffee, M.N. Ivanov, C. Hättestrand, I. Rogozhina & R. Usubaliev 2016. Evaluating the timing of former glacier expansions in the Tian Shan: a key step towards robust spatial correlations. Quaternary Science Reviews, 153: 78-96. Heyman, J., P.J. Applegate, R. Blomdin, N. Gribenski, J.M. Harbor & A.P. Stroeven 2016. Boulder height - exposure age relationships from a global glacial 10Be compilation. Quaternary Geochronology, 34: 1-11. Seguinot, J., I. Rogozhina, A.P. Stroeven, M. Margold & J. Kleman 2016: Numerical simulations of the Cordilleran ice sheet through the last glacial cycle. The Cryosphere , 10: 639-664. Stroeven, A.P., D. Fink & M. Caffee 2016: Deciphering the cosmogenic code to learn Earth’s surface history. Eos, 97. doi:10.1029/2016EO062975. Published on 28 November 2016. Stokes, C.R., L. Tarasov, R. Blomdin, T.M. Cronin, T.G. Fisher, R. Gyllencreutz, C. Hättestrand, J. Heyman, R.C.A. Hindmarsh, A.L.C. Hughes, M. Jakobsson, N. Kirchner, S.J. Livingstone, M. Margold, J.B. Murton, R. Noormets, W.R. Peltier, D.M. Peteet, D.J.W. Piper, F. Preusser, H. Renssen, D.H. Roberts, D.M. Roche, F. Saint-Ange, A.P. Stroeven, & J.T. Teller 2015: On the reconstruction of palaeo-ice sheets: Recent advances and future challenges. Quaternary Science Reviews, 125: 15-49. Blomdin, R., J. Heyman, A.P. Stroeven, C. Hättestrand, J.M. Harbor, N. Gribenski, K.N. Jansson, D.A. Petrakov, M.N. Ivanov, O. Alexander, A.N. Rudoy & M. Walther 2014. Glacial geomorphology of the Altai and Western Sayan mountains, Central Asia. Journal of Maps. DOI: 10.1080/17445647.2014.992177. Goodfellow B.W., A. Skelton, S.J. Martel, A.P. Stroeven, K.N. Jansson & C. Hättestrand 2014. Controls of tor formation, Cairngorm Mountains, Scotland. Journal of Geophysical Research: Earth Surface, 119: 225-246. Li, Y.K., D. Li, G.N. Liu, J. Harbor, M.W. Caffee & A.P. Stroeven. Patterns of landscape evolution on the central and northern Tibetan Plateau investigated using in-situ produced 10Be concentrations from river sediments. Earth & Planetary Science Letters, 398: 77-89. Li, Y.K., G.N. Liu, Y.X. Chen, Y.N. Li, J. Harbor, A.P. Stroeven, M. Caffee, M. Zhang, C.C. Li & Z.J. Cui 2014. Timing and extent of Quaternary glaciations in the Tianger Range, eastern Tian Shan, China, investigated using 10Be surface exposure dating. Quaternary Science Reviews, 98: 7-23. Fu, P., J.M. Harbor, A.P. Stroeven, C. Hättestrand, J. Heyman & L.P. Zhou 2013: Glacial geomorphology and paleoglaciation patterns in Shaluli Shan, the southeastern Tibetan Plateau — Evidence for polythermal ice cap glaciation. Geomorphology, 182: 66-78. Fu, P., A.P. Stroeven, J.M. Harbor, C. Hättestrand, J. Heyman, M.W. Caffee & L.P. Zhou 2013: Paleoglaciation of Shaluli Shan, Southeastern Tibetan Plateau. Quaternary Science Reviews, 64: 121-135. Heyman, J., A.P. Stroeven, M.W. Caffee, C. Hättestrand, J.M. Harbor, Y.K. Li, H. Alexanderson, L.P. Zhou & A. Hubbard 2011. Palaeoglaciology of Bayan Har Shan, NE Tibetan Plateau: exposure ages reveal a missing LGM expansion. Quaternary Science Reviews, 30: 1988-2001. Heyman, J., A.P. Stroeven, J.M. Harbor & M.W. Caffee 2011. Too young or too old: Evaluating cosmogenic exposure dating based on an analysis of compiled boulder exposure ages. Earth and Planetary Science Letters, 302: 71-80. Kleman, J., C. Hättestrand, A. Stroeven, K.N. Jansson, H. De Angelis & I. Borgström 2006. Reconstruction of paleo-ice sheets – inversion of their glacial geomorphological record. Chapter 38 in Glacier Science and Environmental Change, Blackwell Publishing Ltd (ed. P.G. Knight): 192-198. Pohjola, V.A., J. Cole-Dai, G. Rosqvist, A.P. Stroeven & L.G. Thompson 2005. Potential to recover climatic information from Scandinavian ice cores: An example from the small ice cap Riukojietna. Geografiska Annaler, 87A (1): 259-270. Stroeven, P., A.P. Stroeven, J. Hu, J.-L. Chermant & M. Coster 2005: Deciphering the finest imprint of glacial erosion: Objective analysis of striae patterns on bedrock. Image Analysis & Stereology, 24: 135-143. EOS:Third Nordic Cosmo Meeting Rep.